I don’t know how to describe Munich, so let me put it this way. When you travel, there are places you find yourself wanting to come back to so you can explore more of it, or visit a certain place you weren’t able to previously. That’s not how I feel with this city. Munich, instead, is the place where, if I had to relocate here for some reason, I know I’d be so happy living here. From Innsbruck, this was the city we wanted to pass thru. 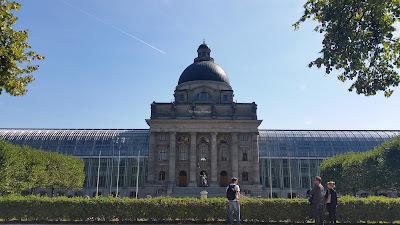 I have previously not been interested in Germany because I’m all about Paris, but Munich changed my mind. I’m actually not sure what this building is, but it’s so grand! 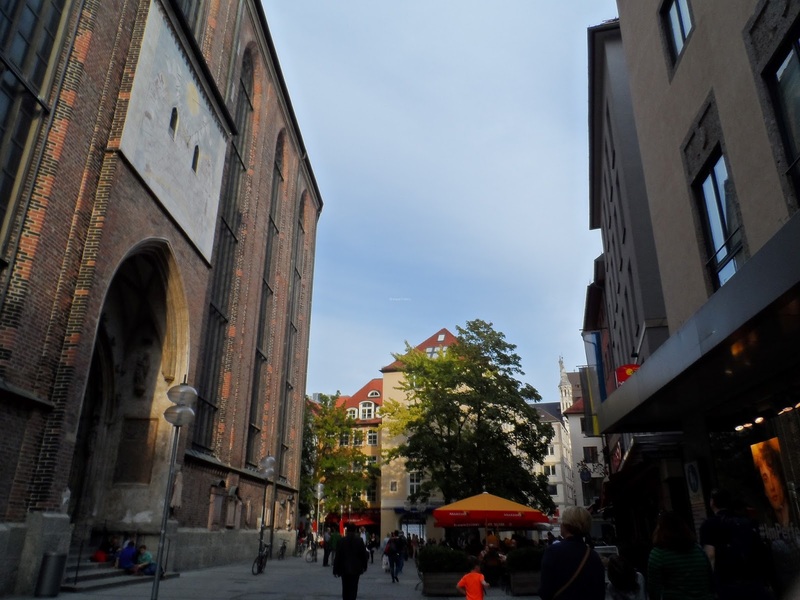 From the moment we arrived in the Munich Hbf and on our way to our accommodations, the vibe was already different. Despite the old architecture and various parks we passed by, there were also very modern buildings. I was highly fascinated by the tram right in the middle of the road and the plants. 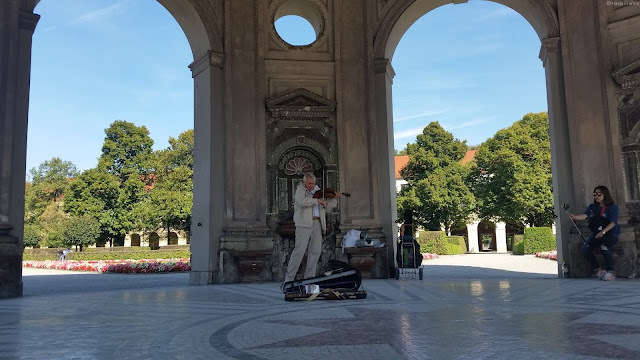 Coming from Italy and Austria, which felt like life was a bit slow-paced and all about art, which I also loved, in Munich I felt very much in the 21st century although it still had dashes of cultural appreciation — one that I hope we can someday achieve in the Philippines too. 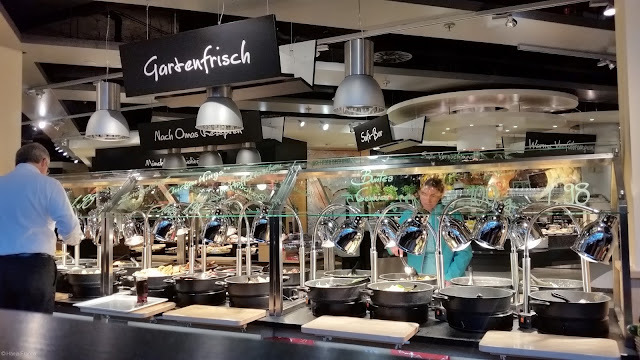 Tip: If you’re looking for rice or Asian food, there’s a small kiosk right in the Munich Hbf which, to one who has been craving for a little taste of home, seemed like heaven. One thing I immediately found out about Germans is that they are so nice and helpful! 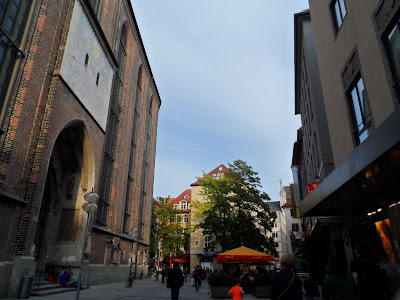 We were at the train station near the apartment, trying to figure out how to get to Marienplatz, when a German walked up to us and asked if he could help us. Apparently he couldn’t speak English much, but he saw that we were very confused yet he still tried to help us. And when he couldn’t communicate with us that well, another German on the platform walked up to us and helped us instead. 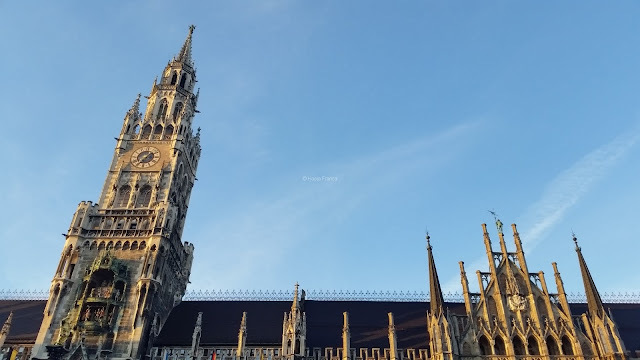 We reached Marienplatz, but the train station was right below a mall, and so up we went and found ourselves at the topmost floor, where we discovered a beautiful open plan restaurant called Dinea. I was so happy to see rice! and fish! and chicken! and beer on tap. I couldn’t make up my mind and ended ordering a lot of food just to try several German food. It kinda blew my mind. Did I mention they have beer on tap? The delicious Paulaner beer, no less. I couldn’t help but also order a pretzel. And their potato gratin and a sausage (not in photo) and some of their rice, because I wasn’t sure when I’d get the chance to eat rice again. Thank you, Germans, for eating rice. I can last on pasta and pizza and bread for seven days, but no longer than that. I needed a fix of the Philippines’ staple food. Afterwards, my parents attended a mass at the Frauenkirche, but my sister and I stayed outside taking photos and just generally getting lost amidst the shops and looking at Germans. Have I mentioned how good looking these Germans are? And how tall they are? At 5 feet and 1 inch, I felt my height. My sister and I only went inside when the gong sounded. I didn’t realize it before that it was the church with the so-called Devil’s footprint, but when we went inside, the area with the step was too dark, and they were ushering us outside quickly so as not to disturb those who were still praying. I’m just glad I was able to tick off one thing off our Muenchen itinerary. The next day, we were supposed to go to Wieskirche, which is a very beautiful church, but we were so exhausted, and my mom just wanted to stay in the apartment. So my father, sister and I went to the city instead. 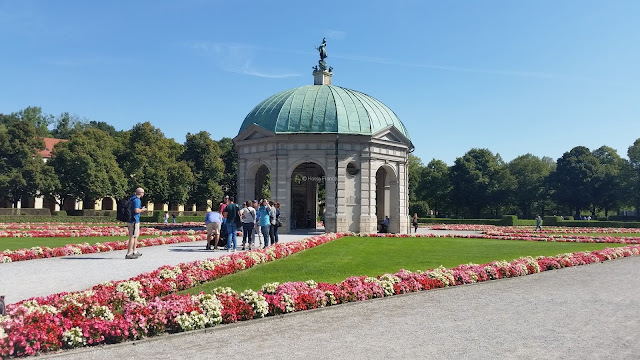 After watching the Rathaus-Glockenspiel, we started walking around and promptly got lost, walking in the English Garden. According to my research, it’s one of the world’s largest urban public park and is actually larger than Central Park in New York. I promised them we can find one of those restaurants in the garden and dine al fresco, but after getting lost for a long time, my dad just wanted to get out and go somewhere else. Along the way, we stumbled upon the Temple of Diana. While papa kept taking videos for my niece Aj, I started walking towards the temple. When I got there, I sat down in one of the benches, and an old man came in and set up his violin case and started playing. At that time, I had no idea what he was playing. All I knew was that it was so heavenly. You could really see he loved music, and that he could feel the music flowing through him. He was selling his album for 10 euros each, but since I was on a tight budget, I couldn’t afford it. His name is Vladimir Turchinsky, and how I wish I bought his album. People started drifting into the temple, lured by his music. He played so beautifully, I actually had tears in my eyes. I think we lost ourselves there for a good 15 minutes, just listening to him play with so much passion. Eventually, we had to keep moving because papa was getting hungry. Thankfully, there were so many trees, it kind of felt like a forest in some parts because there were no concrete roads. It felt like an oasis. Then we stumbled upon one of the coolest things I have ever seen. 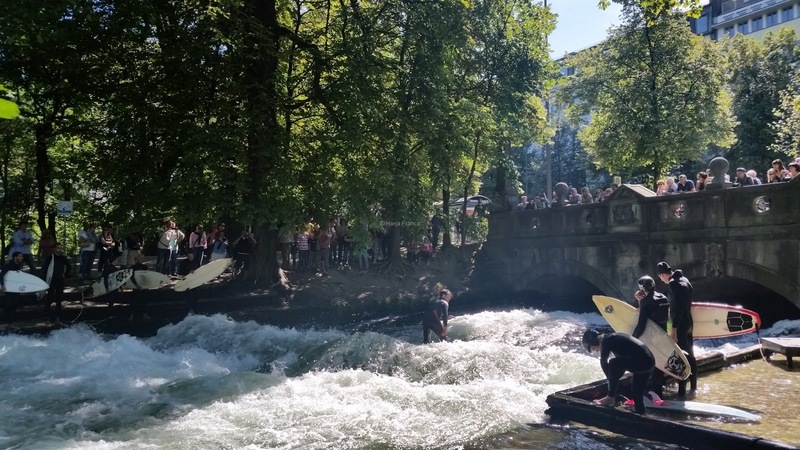 The river’s current was so strong that people actually go there to surf. I’ve read about it online in forums during my research, but I didn’t think I’d actually see it. It was so thrilling to watch, that we temporarily lost our dad because he got so close to the water’s edge. Excuse my outfit, but it was just so, so, so cold that day. 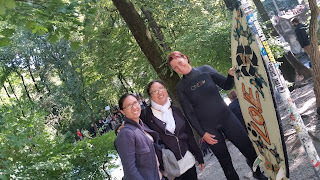 And because we are such tourists, we actually asked one of the surfers for a photo when she emerged from the water. I was surprised she knew about the Philippines, and she was so friendly. The Germans were really nice. Really, our second day in Munich was one of the things that taught me that being part of Team No Plan is also a good plan. After that, we proceeded with our guest to find the restaurant somewhere in the Garden. My dad was about to give up. We took a couple of turns then dun dun dun, we finally reached it! It felt like an oasis. 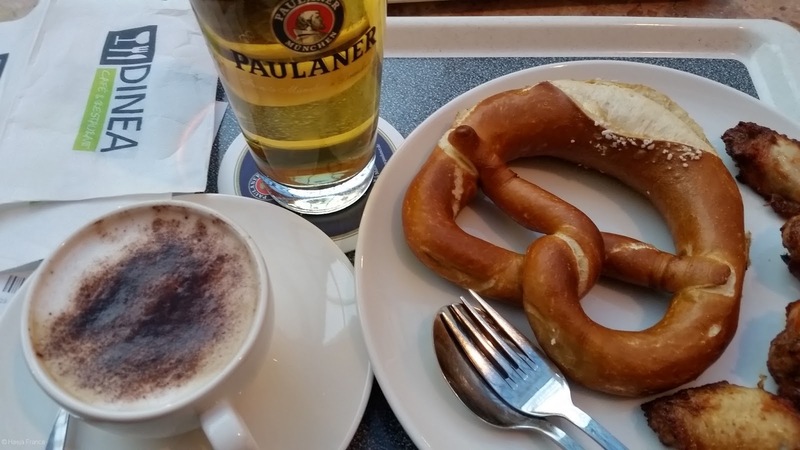 Of course, what is Germany without beer? 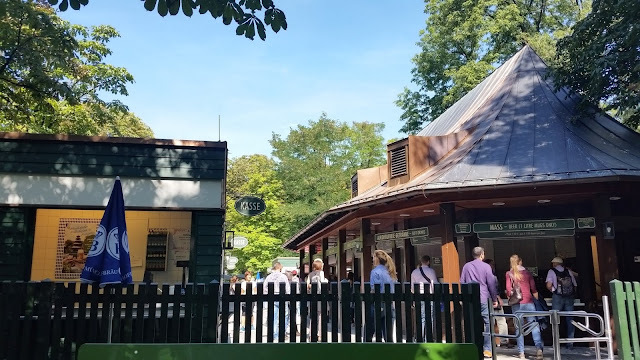 There were a lot of people, both Germans and tourists, milling and buying food. It was just such a nice day out. 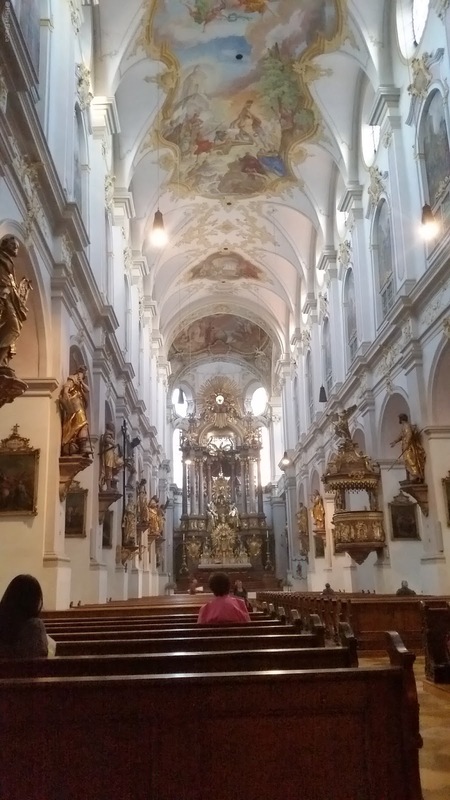 After we had filled out on schnitzel, potatoes, and pretzels, we finally left to go back to the apartment to fetch our mom because we had to go to mass at Peterkirche, the oldest church in Munich. Outside, the Church looked so ordinary, but the inside took my breath away. It was light and airy, a stark contrast to the plain exterior. The mass felt so solemn, and I actually felt shivers down my spine while attending mass. It just felt so surreal. Afterwards, we had dinner and went home, ready for our early trip the next day to Zurich, Switzerland. I hope you’ll enjoy your trip! All photos are unedited. I don’t know how to use Photoshop! Please don’t use my images without permission.